A combination of heat and high humidity can be hazardous to your health. Conditions during high heat and humidity have the potential to cause dehydration, heat exhaustion, heat stroke and in some cases death. Everyone is at risk from exposure to hot temperatures. The following groups are in greater danger of being affected including the elderly people with chronic illness or who take certain medications, infants and preschool children, people who participate in physical activity and those who work outdoor for long periods of time. Prevent heat related illness by keeping cool, taking a cool shower, wearing light clothing and taking breaks in a cool place. Do not leave loved ones and pets in hot vehicles. Remember to drink plenty of water and stay away from alcoholic or caffeinated drinks as they can lead to dehydration. During a Heat Warning, the public is strongly encouraged to check on a neighbour or a friend who may have a greater risk of suffering negative health consequences from the heat and humidity. 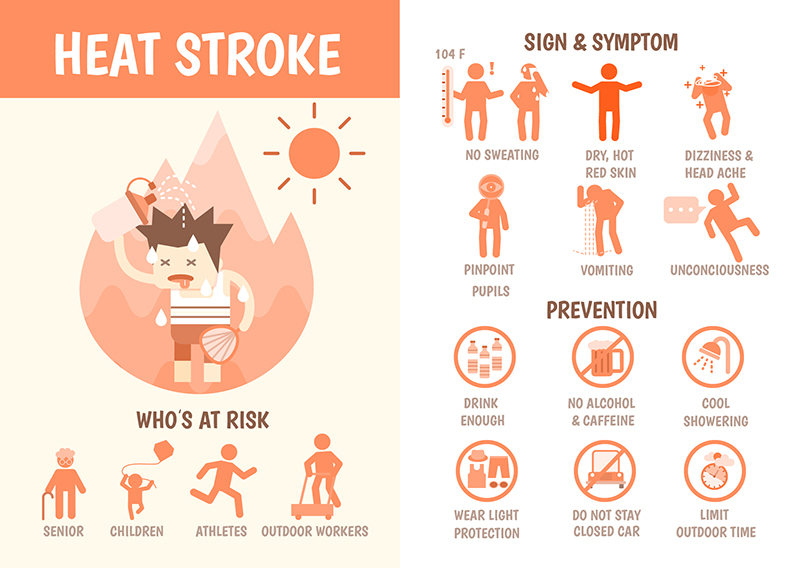 Check the resources below for information on heat related illness and how to protect yourself. Cold weather can cause very serious health conditions and even death. Unprotected skin can freeze in as little as 10–30 minutes, and the risk of developing hypothermia is high. During very cold weather, everyone is at risk; however the elderly, infants and children, people taking certain prescription medications, and people with pre-existing health conditions are in greater danger. There is also an increased risk of frostbite and hypothermia for outdoor workers and people living without adequate heat or shelter. During a cold warning the Health Unit encourages the public to check on family members, neighbours, or friends who may be isolated, disabled, living alone, or without sufficient shelter and who maybe at greater risk of suffering cold weather related injuries.